Although her explanation was hardly scientific there was an element of truth that resonated with me. How many of my thoughts were distracted, unfinished and suspended aimlessly in space? Would this explain my mental fuzziness? Was I unknowingly playing a higher dimensional game of space invaders? And the remedy? To light a joss stick and attach crystals to my shopping list? Not really practical. But I do need to stop this unconscious sponge soaking and instead maintain my focus and clarity. Thinking can be exhausting and stressful. It burns up energy and most of our thoughts are non-productive. It is easy to get lost in our thoughts and forget to distinguish between thinking a thought and being that thought. For example, ‘I am so stressed’ versus ‘this project is quite stressful’. Our mind is the organ grinder to our body, it says jump and the body says how high. Just think of ice cream, can you taste your favourite flavour? Feel how your mouth salivates just at the thought. Now imagine the wider physiological impact from lots of thoughts competing for mind space. Our body attempts to respond to the many different commands from our own “head office”, hence we can feel stressed, tired, ecstatic, bored or calm all within the space of reading our morning emails. It’s an energetic rollercoaster. A cluttered mind is linked to a stressed sense of being. Stress is our arch enemy as it wastes our time, foils our goals and can leave us physically sick. Our western philosophies for dealing with stress centre of an external sense of doing. For example, setting goals, actions, organisational skills, time management skills and effectiveness strategies. I believe this delivers an unspoken message of‘The more you do, the more you will achieve and the better you will feel about yourself.’ But is this healing or just a self perpetuating philosophy for unattainable expectations and disappointments? A growing number of people are turning to Eastern traditions for a sustainable solution. Through Eastern practices of mediation, visualisation, and mindfulness to name a few, people are finding an effective stress management tool as well as a deeper connection to the Self. While the Western approach to stress is about doing, be it ‘more’ or ‘less’, the Eastern approach helps the individual focus on quietening the mind and creating a sense of peace. With this peace of mind, it is actually easier to get more things done. Goals are achieved faster as your mind is clearer. You focus on exactly what you want and execute actions with confidence andclarity. More is achieved in less time. It’s easier to let go of old habits which may otherwise sabotage your quality of thinking e.g. procrastination. Mindfulness and meditation help reduce the impact of our inner critic by simply releasing judgements as well as negative assumptions. It helps stop the labelling of ourselves, others and life’s experiences. It can minimise your internal narrative by keeping you in the reality of what is really happening rather than your interpretation of it. By becoming a witness to your thoughts, feelings and events in your life you move from a position of unconscious reaction to conscious responding. A far more positive and appealing place to be. Not to mention the lack of fuzz! By learning to quieten the mind you can turn down the logical, analytical aspect of the brain and allow your intuitive, creative and solution focused qualities to shine through. Our brains are used to thinking fast, so learning to meditate requires patience and discipline. This one simple meditation below can quieten the mind and create a sense of peace and well-being. However, it may take some time to truly master it. (Find a quiet place where you won’t be disturbed. Sit on a chair or on the floor with your knees crossed. Rest your hands in your lap with your palms facing up. Close your eyes or have a soft fixed gaze). Take a moment to scan your body and mind. Note how you are feeling. To begin, take one deep breathe focusing your mind on the air entering your nostrils, filling the bottom of your lung up to the top and then slowly exhale, again paying attention to your breathe exiting your nostrils. Imagine your ‘in’ breath brings in light and your ‘out’ breath takes away darkness. Once you have enjoyed the benefits of grounding yourself in the moment of each breath acknowledge how you physically and emotionally feel and compare it to the beginning. If you don’t feel any positive difference, start again. It may take time to peel away the layers of competing thoughts and quieten the internal chatter. This is all part of the process. 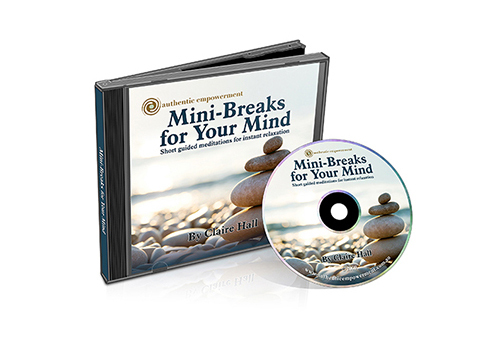 Check our our guided meditation MP3 below.